"Music is supposed to wash away the dust of everyday life" - late Art Blakey, American jazz musician and Grammy Award winner. Come to think of it, that's all a face wash is required to do too i.e., wash away the daily dust and dirt from our face. As per the company website, it is "specifically designed to wake up your dull looking skin in the morning. 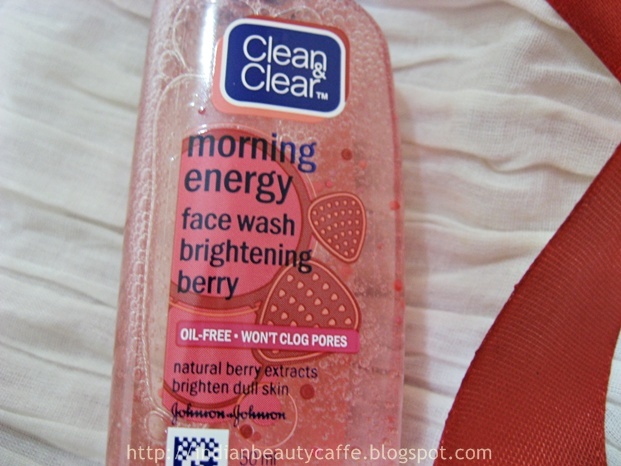 The gentle face wash contains natural extracts of Strawberry and its unique formula is enriched with soft BURSTING BEADS® that gently burst with an energizing fragrance on your skin and let you experience a new wave of freshness every morning." The face wash is packed in a simple but cute, transparent bottle with a flip-top cap. 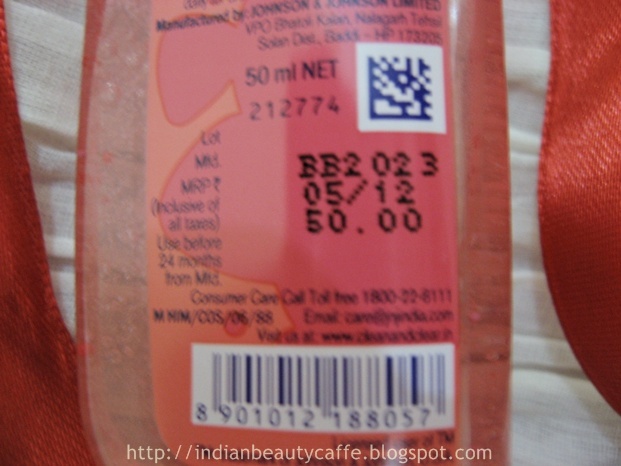 The light pink-colored face wash with its tiny, round beads peeping through the bottle makes it look attractive. The flip-top cap is not very sturdy but is still travel-friendly. Comes in 3 variants. I have 'Brightening Berry'. The other two are 'Energizing Lemon' and 'Purifying Apple'. 50 ml. Available in 100ml also at Amazon.in . Apply a small amount on wet palm and work into rich lather. Gently massage onto face, avoiding eye area. Rinse off thoroughly. Use ever morning for clean , clear and fresh looking skin. Follow with the 100% oil-free CLEAN & CLEAR ™ Skin Balancing Moisturizer for best results - as mentioned on the company website. Did I tell you that I also bought it because it looked like the perfect travel companion... Well, it surely fulfilled that criteria. 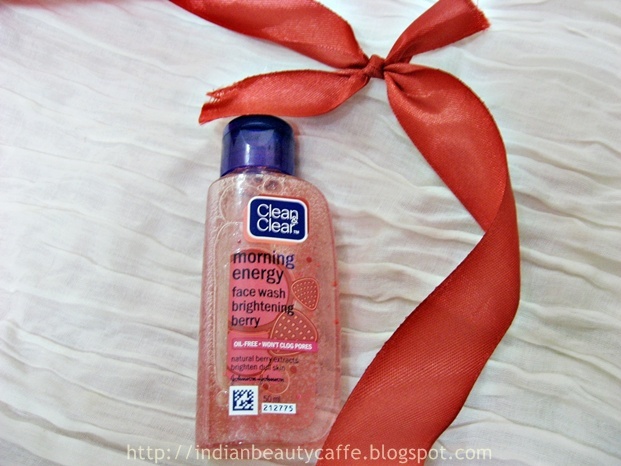 Cute face wash in a cute and travel-size bottle for a cute price - it is definitely a traveller's choice of face wash. Even if you dislike the face wash, you can always re-use the empty bottle while travelling. Talking about the mysterious 'bursting beads', there are not many of them anyway. In fact, there are more air bubbles trapped in this bottle than beads . I tried squeezing out the face wash many times in order to see the beads but no such luck, or maybe they had already burst. 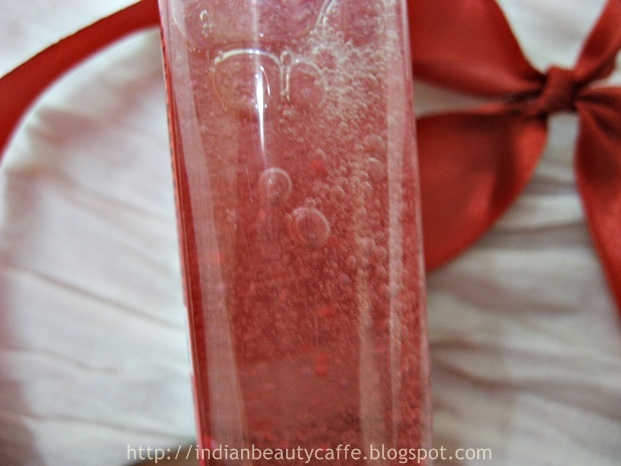 The consistency is quite light and thin, not thick like my Lakme strawberry face wash. The fragrance is very berry-like but it is a very mild fragrance and definitely not enough to energize you in the morning. For the very same reason since it does not smell of any heavy, artificial scent, it seems 'gentle' and 'natural'. I noted a very weird thing though - on the company website, this product claims to contain strawberry extracts while its ingredients mention raspberry extracts! Now, I just hope that atleast one of these berries has gone into this bottle. I do not care which one since I can smell a mix of both. Performance-wise, it is a gentle and low-lathering face wash. 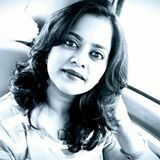 Since it is a bit runny, you need more quantity to wash your face than the Lakme one. In spite of all this, it effectively and efficiently removes all dirt and oil from the face. As you all know, I use oil to remove my makeup and then use face wash to remove the excess oil. I was doubtful if this face wash would be effective for that. But it did clean my face nicely and remove the oil fully. 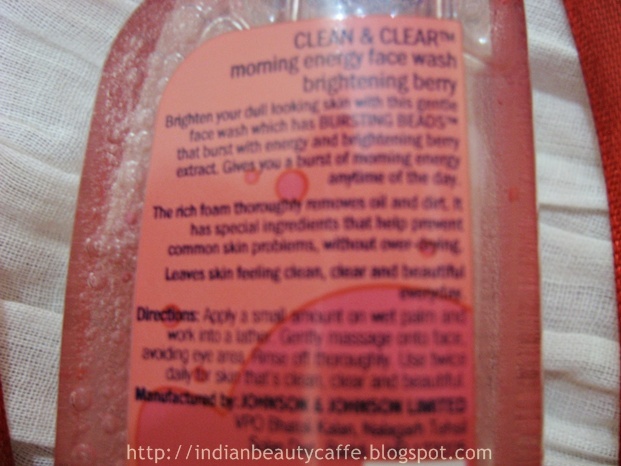 So yes, this is a good replacement for my Lakme face wash in terms of cleansing. As for the 'brightening' claim, I did not notice any. By the way, Mr. B used the handmade soap that I showed you in my Cafe Haul post to wash his face and it instantly brightened up his face. So maybe for brightening, I should try that except that it has been ages since I used soap on my face, but it is tempting nevertheless. I always thought that Clean and Clear was a brand for oily-skin types and never owned a single product by them until this one. I have dry skin but this face wash did not dry my skin further. I use my normal moisturiser after using this, not the one suggested by the company, and still it is fine. Do not get it if you are expecting the fancy brightening and energizing effect or for the bursting beads. But you should definitely try this if you are looking for a face wash that does its cleaning job well and also looks cute. Nothing great... but still very cute! By the way, Junior insists that he studies in Loo KG, Action B and his school name is Princessy School (to be read as UKG, Section B, Presidency School). I have just ordered it yesterday!!! I have tried it today and its great dear ! !.